If you wine & dine in expensive hotel restaurants in Myanmar, you shouldn't have any problem ordering the food because they will have English speaking waiters as well as menu in English. However, if you're one of those tourists who venture on their own eating out in smaller eating houses and establishments, you may need some help in communicating with the waiters. CLICK (OR TOUCH) TABLE HEADER COLUMNS TO SORT BY ASCENDING OR DESCENDING ORDER IN ENGLISH OR BURMESE SCRIPT. As a foreigner in Myanmar, you will find it very useful to be able to order food and beverages in Burmese. You will have to pick up some vocabulary used in ordering food. Secondly, you need to understand some likely answers from the waiter. That's exactly what we are going to learn in this lesson. The phrase xxxx ရမလား | "xxxx yah1 ma1 la3" is used to ask if something is available. ဘီယာရမလား | be2-ya2 be2-ya2 yah1 ma1 la3" means "Beer available?" 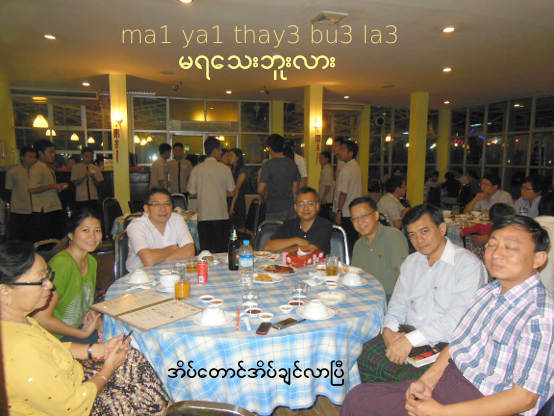 xxxx မရသေးဘူးလား | "xxxx ma1 yah1 thay3 bu3 la3"
or, simply "ma1 yah1 thay3 bu3 la3" without mentioning the food item. ရ | yah1 -- to get (verb); to obtain (verb); roughly means "available"
ခေါက်ဆွဲကြော် မရသေးဘူးလား | khout-hsweare3-kjau2 ma1 yah1 thay3 bu3 la3 -- Fried noodles not ready yet? The word ကြော် | kjau2 means "to fry" and ခေါက်ဆွဲ | khout-hsweare3 refers to noodles. So, ခေါက်ဆွဲကြော် | khout-hsweare3-kjau2 means "fried noodles". ကြာလိုက်တာ | kja2 lite da2 -- Why is it taking so long? ကြာ | kja2 means lengthy in time. လိုက်တာ | lite da2 means to the extreme degree. ကြာဦးမလား | kja2 ome3 ma1 la3 -- Is it going to take long? It all depends on how busy they are, and which eatery you dine at. You need to remember two primary measure words, also known as numerical classifiers. For food items, use ပွဲ | pweare3, which can be soften to sound like bweare3. It means an order of something to eat. For drinks, use ခွက် | "khwet" meaning a glass or a cup. ခေါက်ဆွဲကြော် ၃ ပွဲ | khout-hsweare3-kjau2 thone3-bweare3 -- fried noodles for 3, and so on. Please refer to Lesson 12 for numbers and measure words in details. 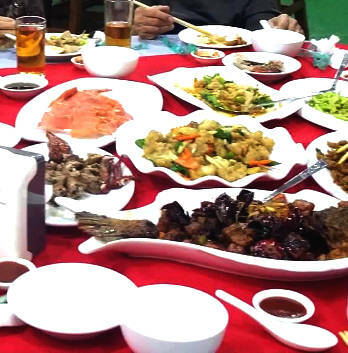 Beer, alcohol, and liquors are available in a large number of eating houses and almost all up-scale restaurants that are licensed to sell alcoholic drinks. You can order local Myanmar draft beer in a glass or a jar cheaply. It is easy to remember the measure word for a jar. The same English word "jar" is used, and pronounced as ja3. ဘီယာ တစ်ဂျား | be2-ya2 ta1-ja3 means one jar of beer, and it is about 5 glasses. Tiger beer brand from Singapore is also available, but if you read the printing carefully, you will see that it is brewed and canned in Myanmar. Myanmar Beer also comes in tin cans. Measure word for plastic bottles and tin can in Burmese is ဘူး | bu3, while ပုလင်း | pa1-lin3 is used for glass bottles. 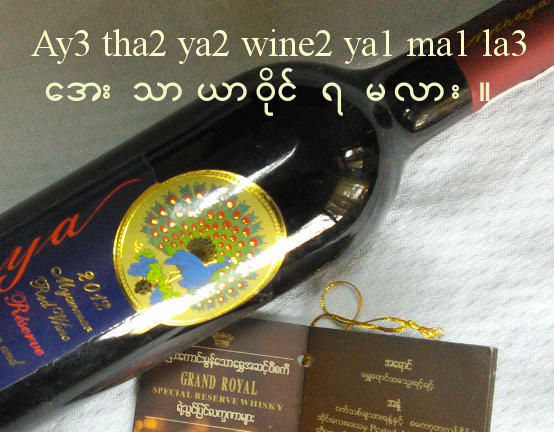 While in Myanmar, try Myanmar made Aythaya Wine and Grand Royal Whisky. Aythaya Wine produced by a team of German experts is the first Western style wine in Myanmar made with grapes grown in the village of အေးသာယာ | ay3-tha2-ya2 located between Inle Lake and Taunggyi at the altitude of 1,300 meter above sea level. Grand Royal Whisky is the product of over 17 years of experience by Scottish Master Blender William Arthur. Those are the affordable gift ideas. As for myself, I am always content with soft drinks or plain water for dinner. English word "parcel" is used in restaurant and eating houses in Myanmar for take out food packed in styrofoam boxes. It may not be correct English, just like "packet", which is a direct translation of "pau" in Mandarin Chinese is used in Singapore for the take out order. ခေါက်ဆွဲကြော်တစ်ပွဲ - ပါဆယ် | khout-hsweare3-kjau2 ta1-bweare3 - pa2-hseare2 -- One fried noodles to go! You will find a number of packaged and processed food with "Halal" printing both in English and Arabic. That means they are approved by Islamic Religious Affairs Council in Myanmar. You normally don't expect a Chinese person to be a muslim, but some Chinese in Myanmar are Muslims, and you can ask the local people where you can get ပန်းသေးခေါက်ဆွဲ | pan3-thay3 khout-hsweare3, a type of fried noodle similar to Mee Gorang in Malaysia and Singapore. 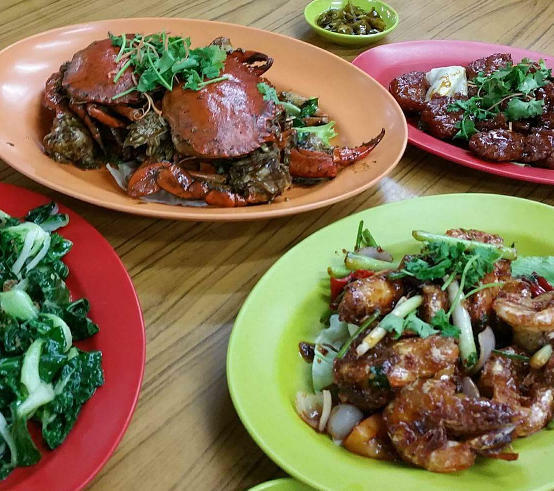 Their spicy cooking style probably comes from the south-western part of China. You can also get Halal biryani rice with chicken and mutton. Those shops are usually owned by Indian Muslims, and some are wealthy enough to expand into chain-restaurants. Normally, you have a choice of either a spoon and a fork or a pair of chop sticks. Go to an American KFC style fast food restaurant, and you will be surprised to be served with a knife and a fork. This will be a totally new experience if you have considered fried chickens to be "finger licking good!" 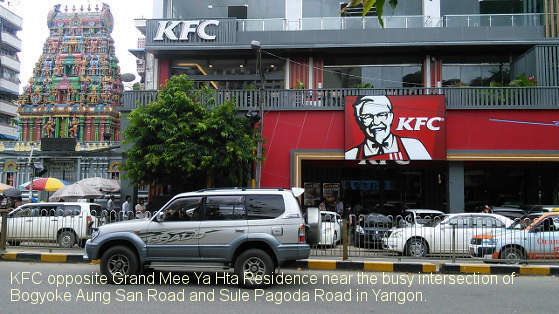 In early July 2015, the real American KFC opened it's first branch in Yangon near the busy intersection of Bogyoke Aung San Road and Sule Pagoda Road. As for eating rice, just like other south east asian countries, a spoon using your right hand is supposed to scoop up the rice while use your fork in the left hand to push the rice into the spoon in front. This makes more sense and certainly more efficient than using a fork-- American style, or chinese chop sticks. For breakfast, Burmese people have ပဲပြုတ် | peare3-byoat, a type of pea steamed and fried with rice, or eaten with နံပြား | nun2-bya3, round baked staple food made from dough of flour. Ethnic Shan or Kachin people eat ခေါပုတ် | khau3-boat, which is a type of black sticky rice grounded and baked or fried. Ungrounded Burmese version of glutinous rice is called ကောက်ညှင်းပေါင်း | kout-hnyin3-poun3, which is served with the mixture of grounded sesame seeds and salt sprinkled over it. Another breakfast or lunch item favorite with the Burmese people is မုန့်ဟင်းခါး | mone1-hin3-kha3. If you have ever tried Vietnamese Beef Noodle Soup or Malay Laksa, it is the same idea, except for that the soup base is made from a type of cat fish, and the rice noodle has a distinct fermented aroma. The soup base of mone1-hin3-kha3 contains baked rice and pea flour, banana stem, hard-boiled duck eggs, onions, lemon grass and fish sauce. The fish is separately fried with minced garlic, onion, ginger, and turmeric powder until golden brown for the appetizing aroma, and added to the soup base. It is eaten with crispy fried onions or fried melon, and garnished with fresh cilantro (parsley), lime or lemon, and sprinkle a little chili powder before serving. It is my favorite; the ingredients of mone1-hin3-kha3 seem to raise the overall endocrine system of the human body and one bowl is never enough. But I have to warn you, if you are a Westerner not accustomed to the taste of fish gravy, you might not find it pleasant. Then, you should try အုန်းနို့ခေါက်ဆွဲ | ome3-no1 khout-hsweare3, which is another soup-based noodle, but made with coconut milk, garlic, ginger, onions, hard-boiled eggs, pea powder, chili powder and chicken. It is closer to Malay Laksa. Another of my favorite is ခေါက်ဆွဲသုပ် | khout-hsweare3-thoat, a kind of salad with the mixture of noodle, rice in chili oil, cabbage, bean sprout, green papaya, toufu, shredded dried shrimp flakes, mashed potatoes, fish sauce, tamarind sauce with garlic, and garnished with fried crispy garlic in oil. There are a number of decent restaurants specializing in Burmese food. Contact Asia Pearl Travels for details. Be forewarned about eating in unclean roadside stalls. For some reasons, local people seem to have developed immunity to unhygienic food preparations in some roadside stalls. Is the immunity in the Burmese gene? No, even returning Burmese living abroad have lost this immunity and develop stomach upset problems. For your own convenience, bring medication for diarrhoea if you want to be adventurous. On the other hand, outbreak of e coli, cholera or hepatitis will affect local and foreigners alike. Learn how to say, "I have a stomach ache" in lesson 21. I think I have covered enough for you to be able to exchange a fairly good conversation with the waiter, and at the same time introduce you to the background of food in Myanmar. You will just have to build up some more vocabulary on the menu items. The main staple of Burmese is ထမင်း | hta1-min3 - rice, which is eaten with dishes called ဟင်း | hin3. To answer that question, I have listed the vocabulary of food menu items on the left side. Visit Myanmar with Asia Pearl Travels, and enjoy your meal!